Its been several weeks now since the event known as The European Outsider Art has passed by . I was hoping to get this final part to the weekend out much earlier but basically other stuff got in the way including losing 2 drafts due apparently to a lost wifi connection or some such technical compatibility hitch . The final day of the conference was pretty amazing and my original intention was to give each individual event their due credit. Experiencing at day first hand is very different from describing each event as it happened in chronological order , the term being bogged down in detail springs to mind here . So rather than that, this is a brief summary of what for me felt like one of those turning points where you come away feeling inspired , elevated and sufficiently grounded at the same time . Day 2: Morning , Back in a gallery room , chairs set out in rows awaiting the mornings speakers .. Yesterday’s faces are just that little more familiar, more chit chat, the pictures on the wall are becoming familiar too. 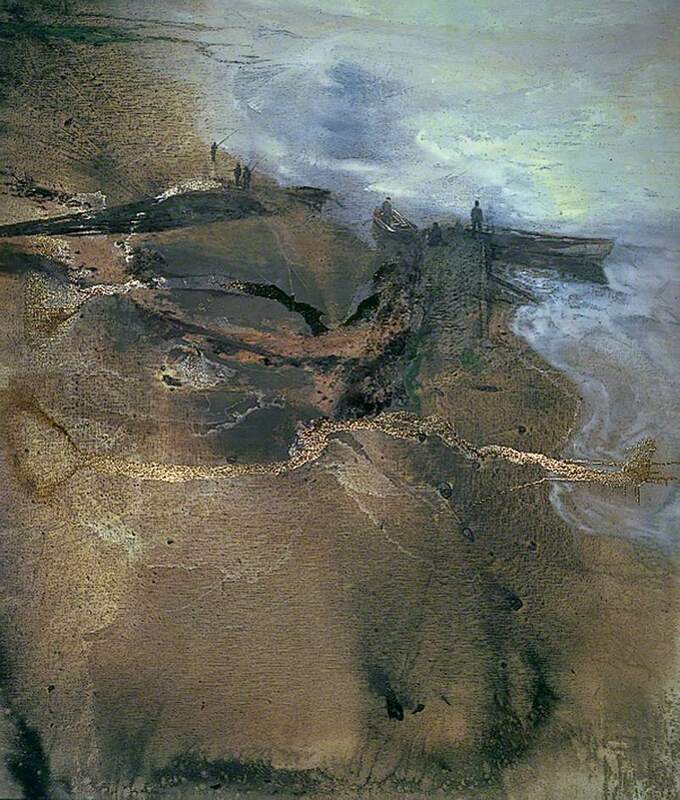 I am drawn to one painting in particular by Martin Andrews titled The Estuary, it’s a space of transition where one thing merges with another. River, sea, sand, mud – all shifting boundaries, the painting itself seems to ebbs and flow too between the real and abstract. Specks of people, Lilliputian in scale, stand at the edge of what could be mistaken for the belly of a half sunken torso (quicksand indeed) some of these figures stand fishing for something whilst a pair of singular boatmen await in their vessels to take passengers across the river what is the River Thames or but to my mind it could just as easily be the river Styx. The boundaries between ” Fine Art” , “Outsider Art ” and “Community Arts” also merge and overlap at the edges , which provides an interesting place for thought and debate but also a place where you can get caught in up the minutiae and is often best avoided. 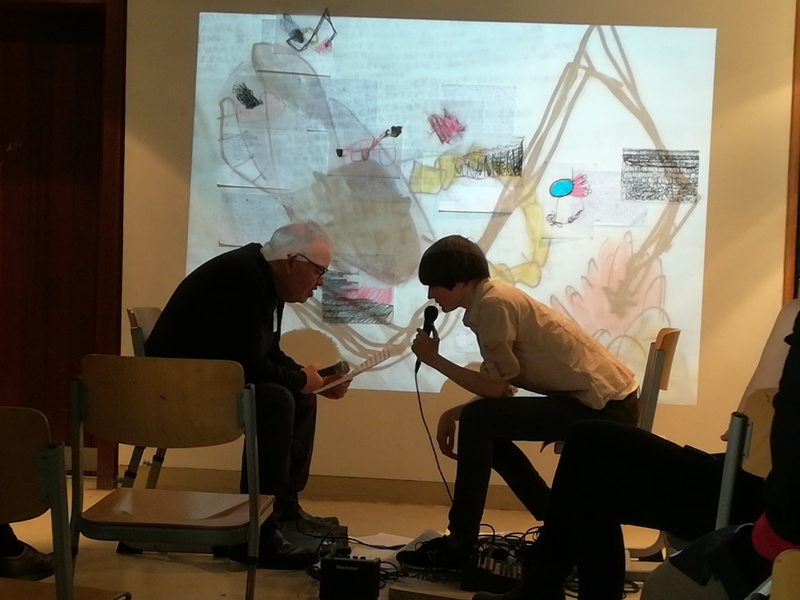 Meanwhile back in the room, on terra firma, proceedings begin with talks by Marc Steen and Thomas Roesk – recapping and reminding us of the quiet evolution that is taking place. In the big scheme of things it’s only art we are talking about here but I love it and besides it’s not just “art” it’s about something else, something that art does, it’s about people, desires and visions and how we relate and communicate with each other, it’s a beautiful and amazing language. It’s about Knowledge and understanding, you know- important stuff . So feeling a little enlightened, it’s time for a breakout session , My choice is Manchester based Venture Arts. I hear northern voices, the voice of the artist with accents and words such as chuck, aye and lass …beautiful words full of warmth and tenderness which are often extracted from the cutting edge world of Art Practice and The Creative Arts Industry (whatever that means . Barry Anthony Finan and Rosanne Roberson sit in chairs facing each other, their profiles before us almost silhouetted by the lit screen behind them . Shifting images of shapes hand written words, text , in pen or felt tip pen in sky blues and pinks and numerous other colours . Barry picks up a microphone and quietly reads from a script , its very quiet , we have to listen focus our attention , we the audience have to put some effort in. Out of the whispering words a dialogue is emerging between Barry and Rosanne and we get drawn into it , partaking in something intimate but not intrusively. I don’t know if its art or performance or theatre and it doesn’t matter, what matters is being there in the moment , feeling . After the break, back up to the gallery room and a series of Artist presentations . 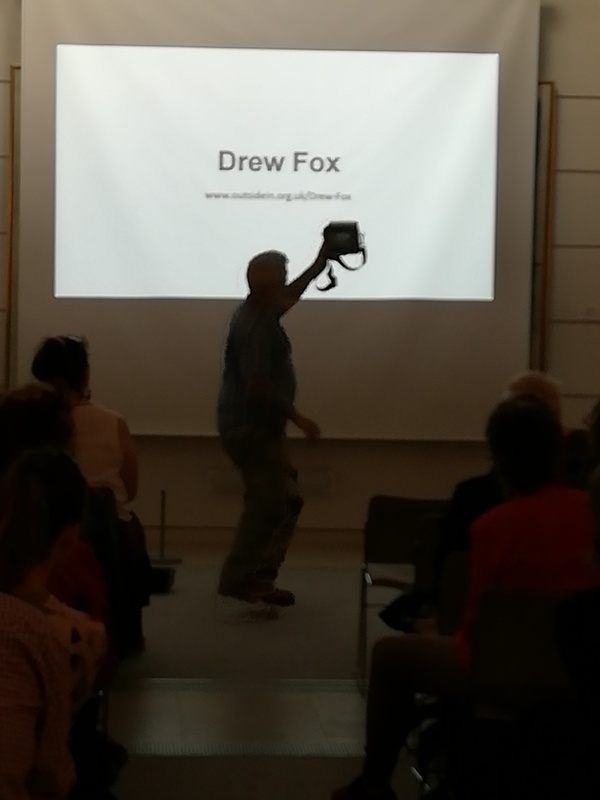 Five in all, each one wonderful ( we the audience are filled with wonder ) Drew fox retells his incredible journey , how one day whilst out on the beach with his two children he has a heart attack and DIES! While medics arrive and apply CPR Drew enters what he calls the Realm of the dead . He tells us what he saw , where he went, and its like being inside someone else’s dream sequence .Here the parameters of time and the spacial are let loose . Drew is of course (he is here talking to us) miraculously brought back to life but there are concerns in relation to brain damage due to lack of oxygen. BTW Drew at some point around here mentions, that he was a medic working in palliative care at the time , so he has an awareness of what is happening to him . He his taken to hospital and kept under observation ,where once again he suffers an second heart attack and dies again !!! Whilst flat- lining he once again finds himself in the Realm of the Dead , talking to his ancestors and guardians walking through labyrinths and walled citadels before being brought back to this world of the living . Cynics and sceptics could argue that a brain staved of oxygen would produce such hallucinations but you kind of think that misses the point of such an incredible journey . The reality is that Drew’s recovery takes several years during which time he dwells on his experience and how to convey what he felt and witnessed. He builds his own large format camera from a biscuit tin and grinds lens himself to get the effect that he wants to achieve . Now no longer working in the place of his former lives, he takes photographs trying to recapture something of where he has been , goes to his shed and constructs model avenues and pathways which look like aerial images of neolithic sites and cities . I think everyone in the room is glad just to be there and maybe wondering where we go to when we exit the land of the living . Emma talks and as she talks she moves , choreographed moments uniquely individual and expressive , the words come out short burst between the shifting movements of her body and the flowing film narrative unfolding on the wall at times beautiful and tender abruptly turning harsh and unsettling . In its totality it is wholly and breathtakingly mesmerising. 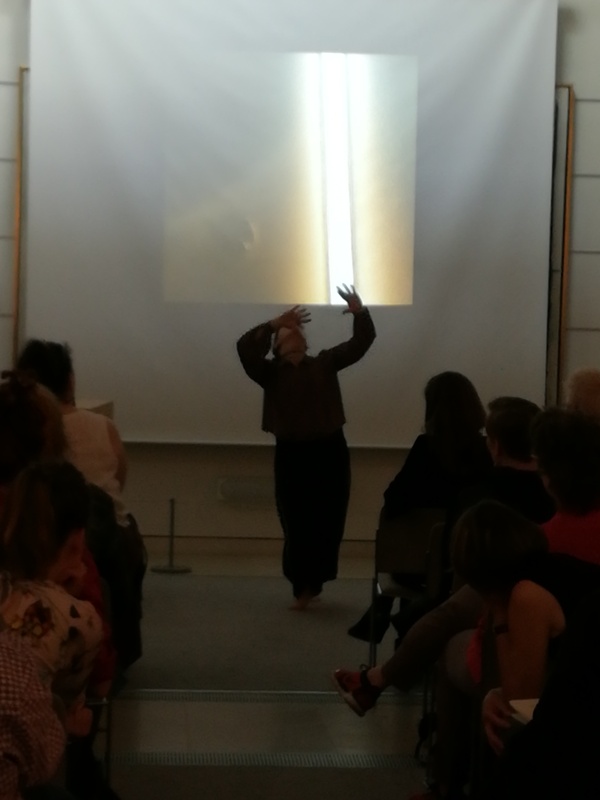 There is rapturous applause but this is not entertainment this is the voice of one person who happens to be an artist . All this so far and more to come , we take a break and return to another breakout session. I opt for a musical experience in the form of Joy of Sound . I enter a room of people sat in a circle each one holding an instrument , stringed and percussive from a range of cultures by the look , some look home made . I have to choose from a range of instruments and pick up a hybrid acoustic flying V guitar . Chris Leeds leads the group a mix of conference goers and around seven or eight music facilitators , we are all tuned to the same key signature and know the ground rules of when to start and stop . At the signal we start , a cacophony of sound and we are all enjoying ourselves and making facial contact looking for the signals to change ,then we start to vocalise and this is where the magic starts to begin , we copy one sound one voice and with the aid of Chris and his facilitators begin to shape it within the musical rhythms we are creating , Your sound is my sound , my sound is your sound we are working together and letting go , It feels shamanic and ritualistic cutting through our conference reserve (I don’t think its an exclusively British thing ) the accumulation of ourselves and what we have experienced over the weekend . Unpacking and sharing our voices rise and fall and when we come back down to earth we are ourselves again but seen and acknowledged . The conference is nearly over now , people have boats and planes and trains to catch . The close of a good weekend I decide to stay for the final session , A time to unwind a workshop lead by the artist Phil Baird based on the work of Scottie Wilson . about half a dozen of us sit around adjoining tables chatting and doodling , its really pleasant and at the close we gather our individual pieces of work onto one table , smile and chat a little bit more before our last goodbyes and head for our destinations.